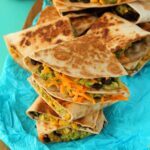 Vegan Quesadillas – Easy, Cheesy and Delicious! 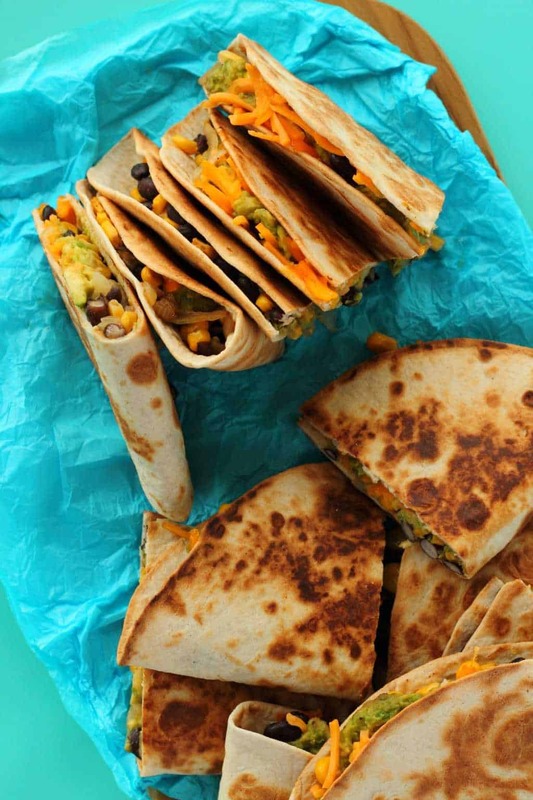 These vegan quesadillas are just the yummiest little packages ever! And as small and cute as they are, they are also amazingly filling! 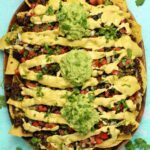 This is likely due to the the black bean and corn mix that we used, and, topped with guacamole and vegan cheese they are totally divine. Avocado is not something I would normally heat up. Like if I have avocado on a vegan pizza, then you can bet I put it on after the pizza has cooked. But in the case of a vegan quesadilla, this isn’t an issue because everything on the inside is just nicely warmed, not cooked. 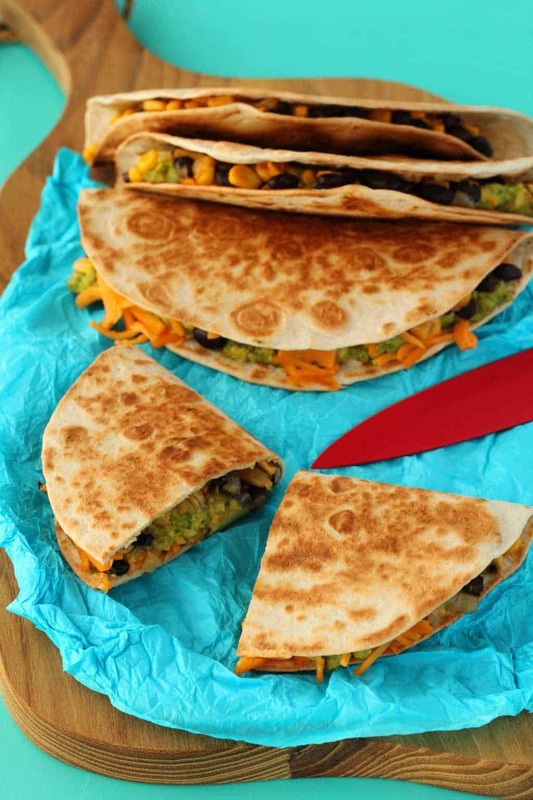 The vegan cheese gets a little melty which helps to close the quesadilla nicely and seal everything in, but really what’s cooking is just the outside of the tortilla and everything else is just getting a nicely warmed and melty. 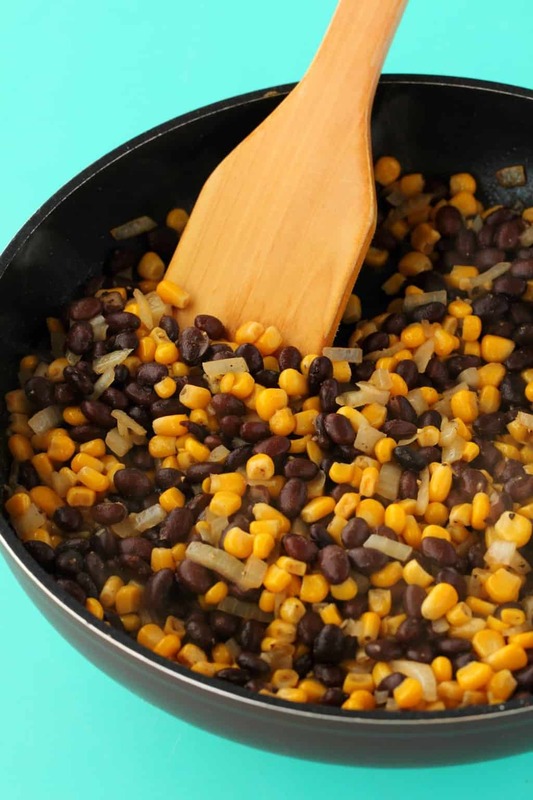 The black bean and corn mix is super easy to make, and really so delicious you will likely want to use it for all sorts of other things. It’s just a case of frying up a little onion and crushed garlic with some spices in olive oil, then add some black beans and sweet corn and fry it up until nicely warmed, add salt and pepper to taste and there you have it – delicious bean mix! Make up your guacamole which is super simple, just a couple of avocados mashed up, squeeze half a fresh lime, and add sea salt and black pepper to taste. 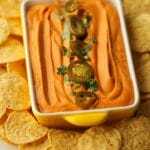 Grate some vegan cheese and now you’re ready to go. 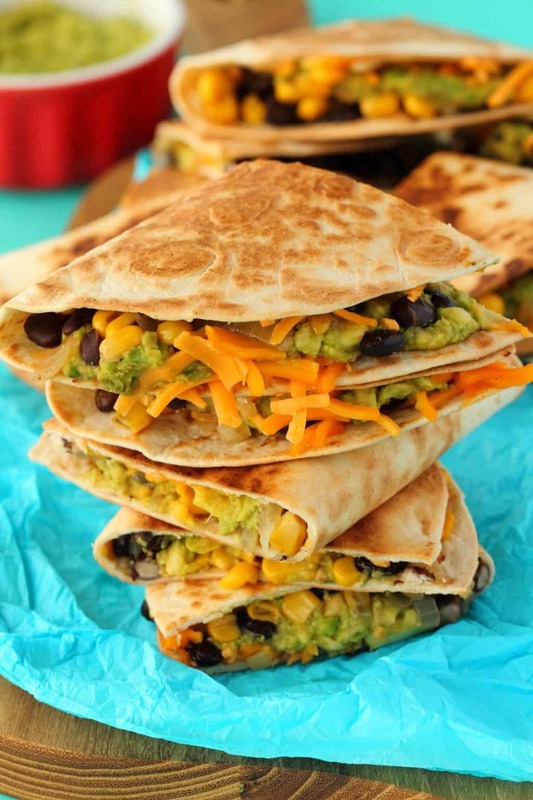 Heat a frying pan (no oil required) and then add a tortilla, let it get nice and toasty and a little browned, then flip it and add some black bean and corn mix to one side, some guacamole on top of that, and finish with a little vegan cheese. 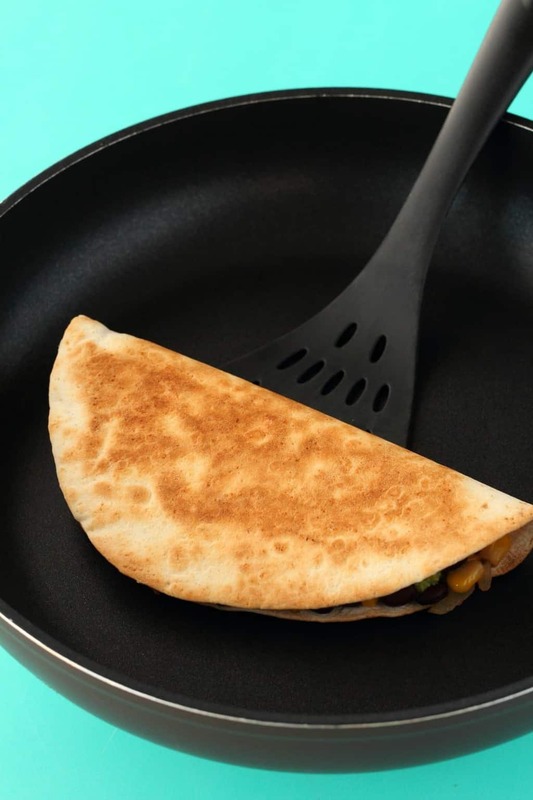 Then fold your tortilla and pat it down with your spatula so that it sticks a little. Let it cook for around 2 minutes and then flip it and let it cook on the other side until both sides are nicely browned and toasty. I have to admit, since there are 8 tortillas, cooking them can get a little tedious. At a few minutes per tortilla, you’re doing the cooking part for at least 30 minutes and it’s very hands on. I have seen some people cook two per pan, but to me the logistics of that were a little too complex. So put some music on, have a glass of wine and get zen with it. I think this is a perfect dinner meal but to me it also fits pretty well as breakfast food. Is anyone with me? Breakfast or dinner? I think it fits well for either. Enjoy them for dinner (or breakfast!). 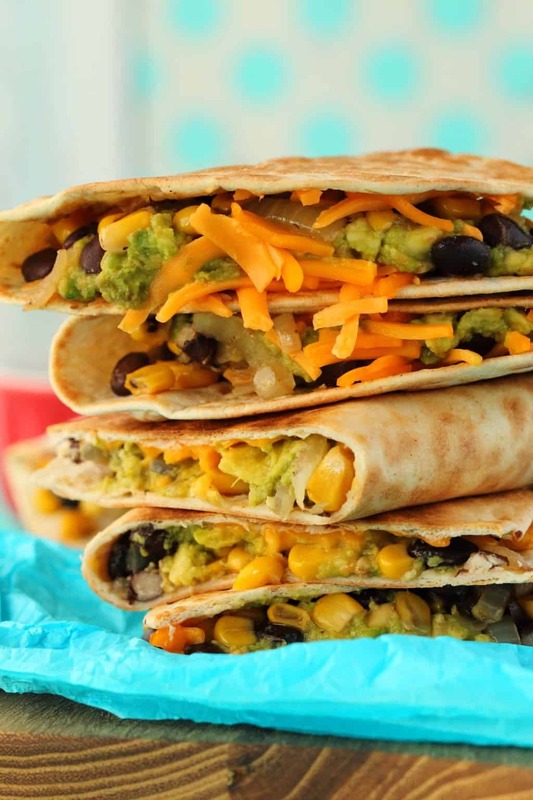 They are best eaten right away, but if you wanted to prepare anything in advance, you can make the black bean and corn mix and keep that in the fridge along with the grated cheese to save time for when you want to assemble them. 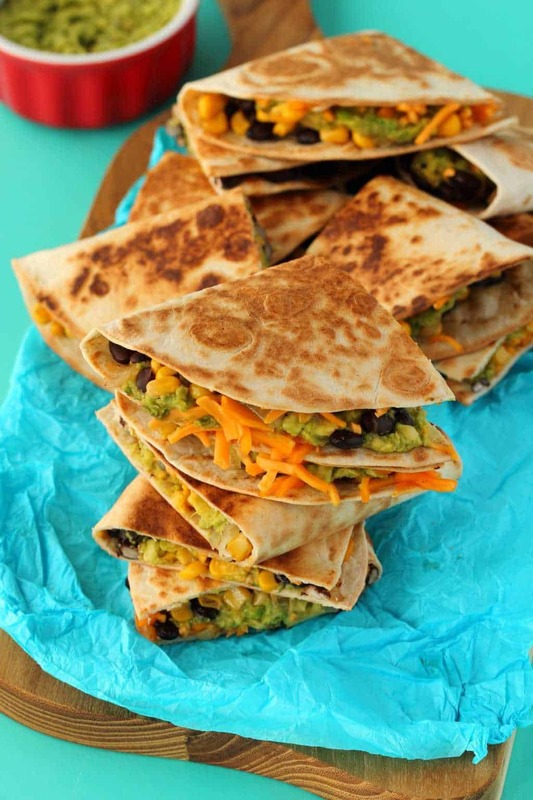 I wouldn’t advise making the guacamole ahead of time, make that when you are about to use it, and eat the quesadillas right away or within a few hours of making them for the best results. 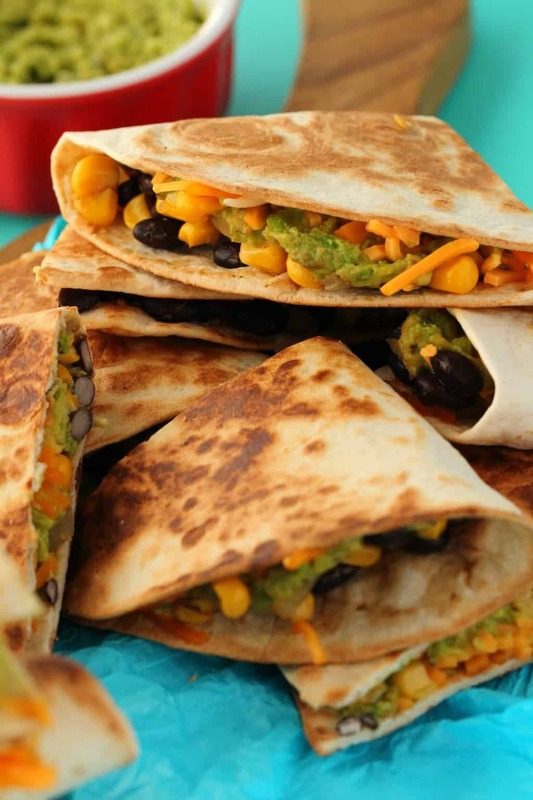 So let us know what you think of these vegan quesadillas in the comments! 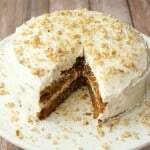 Rate the recipe too please thanks so much. 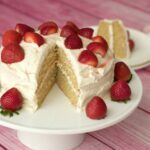 Sign up to our email list to stay updated with all our latest recipes posted to the blog, you’ll even get a free 10 recipe ebook with fabulous dinner recipes when you sign up! 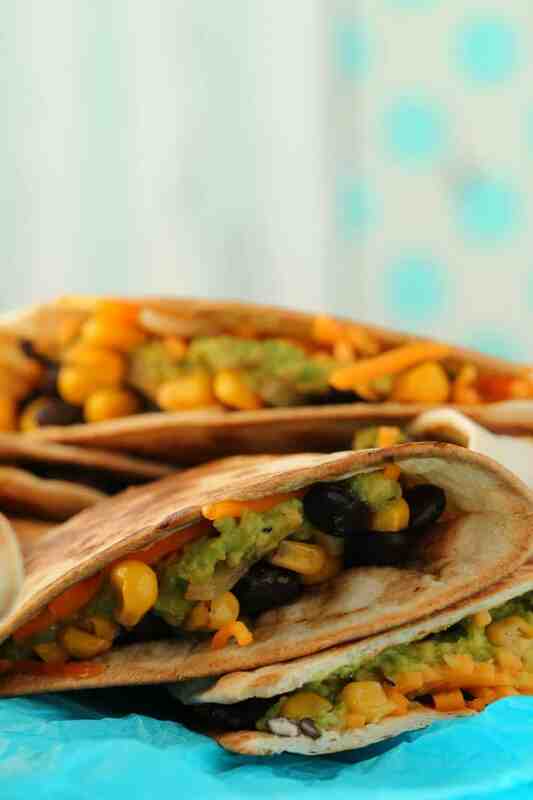 Vegan quesadillas stuffed with black beans and corn, guacamole and vegan cheese. Super filling, hearty, cheesy and very easy to make. Prepare your black bean and corn mix. Add the chopped onion and crushed garlic to a frying pan with the olive oil. Add the cayenne pepper and cumin and sauté until the onions are softened. Add in the black beans and corn and sauté until warmed and well mixed with the spices. Add in sea salt and black pepper to taste. Set aside. 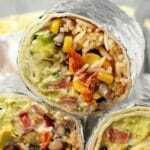 Prepare your guacamole: Mash the avocados, squeeze in the lime juice and add sea salt and black pepper to taste. Set side. 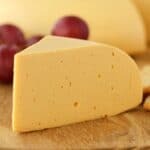 Grate the vegan cheese and set aside. 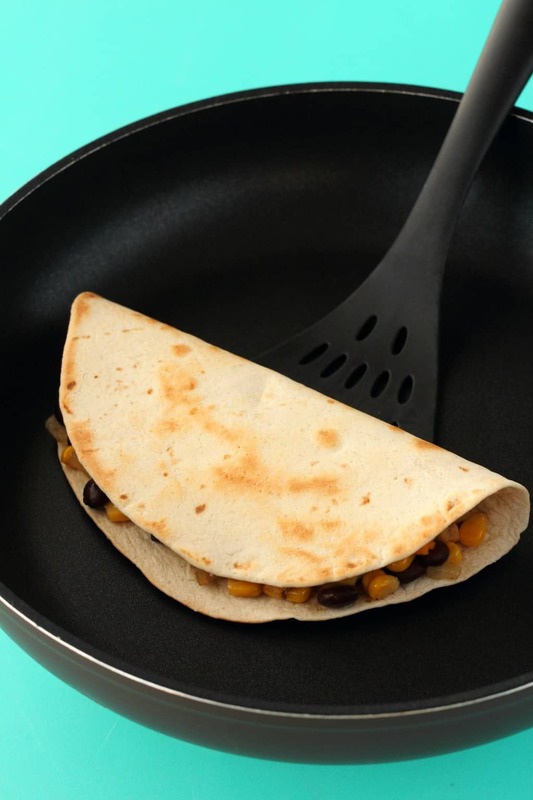 Heat up a frying pan (dry, no oil) and then add 1 tortilla to the pan. Let it toast a little on one side until very slightly browned, and then flip it. 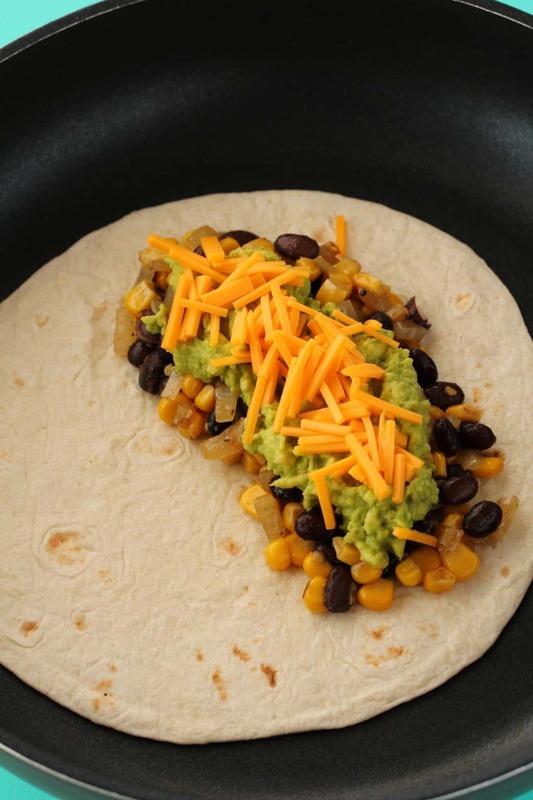 Add some black bean and corn mix to one side of the tortilla, topped with some guacamole and then some vegan cheese. Fold the tortilla over to close it. Pat down with your spatula so that the top sticks. Cook for a couple of minutes before flipping and cooking for a couple of minutes on the other side so that both sides are nicely browned and toasted. 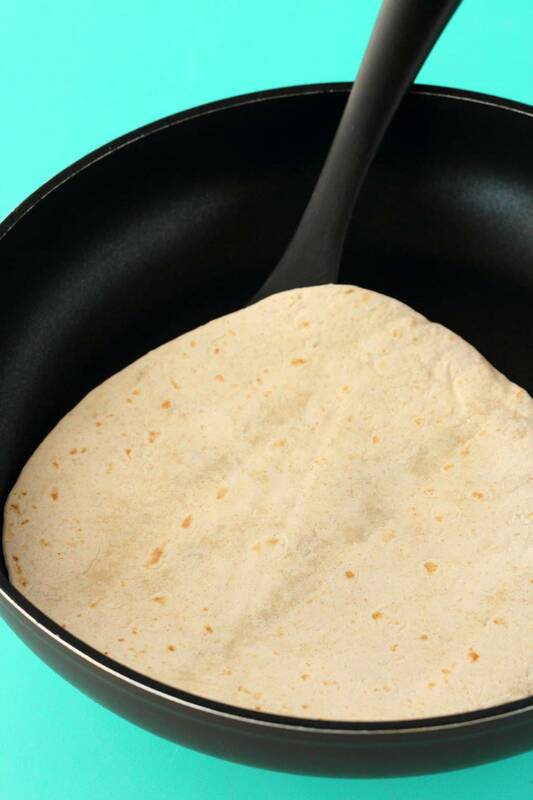 Remove from the pan and repeat with the next tortilla until all 8 tortillas are finished. 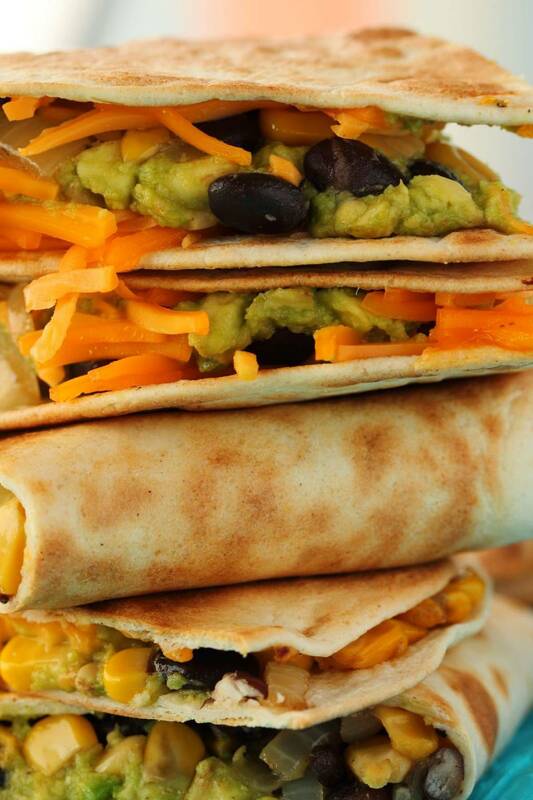 Cut each quesadilla in half (or even into quarters if you prefer) and serve. 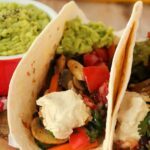 *This meal could be gluten-free if corn tortillas are used. 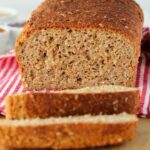 Very appetizing and simple recipe for the unexpected visitor and also just a quick, tasty meal. I intend to try these. I don’t think that the tortillas need to be pre-toasted. We have made chicken quesadillas in the pasta. I just make two on the counter, fold them in half, and then cook two at a time, 2 to 3 minutes per side. Works great for just 2 people. 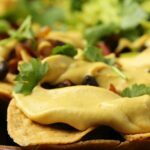 Delicious and quick vegan recipe. I had to used avocado oil to spray my pan before toasting tortillas and it gives the quesadilla an amazing glaze. looks amazing!! 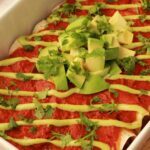 i want to make it but my friend doesn’t like avocado.. will it work without it too?